In my last blog I shared about my husband and I experiencing years of secondary infertility. But miraculously, one day I discovered I was pregnant! Several months into the pregnancy, I sat on the floor playing a card game with my young son, Steven. It was shaping up to be one of the best summers ever. Steven was savoring every minute of the long hot days, our Golden Retriever, Ginger, had delivered seven adorable puppies, and after years of negative pregnancy tests and doctor visits, I had a new life growing in my womb. I drove home. Climbed into bed. Pulled the covers over my empty womb and my empty heart and cried. I was mad at God. If this is how You love me, then forget it. I gave God the silent treatment as if I could somehow pay Him back. God and I had a lover’s quarrel that summer. Actually, I was the only one arguing. I was mad. But He stayed right by my side, waiting, wooing, and eventually drawing my broken heart back so that He could heal it once again. His passionate pursuit and relentless romance continued. This was a see-through place, but until I opened my eyes, I would not see God. Could it be that the puncture wounds in the canvas of your life—the losses, the disappointments, the crushing blows—might actually become the rent places of the soul through which you can see God? Through which you can peer beyond your earthly trappings into glory moments beyond? Through which you can see His light bursting through the openings? 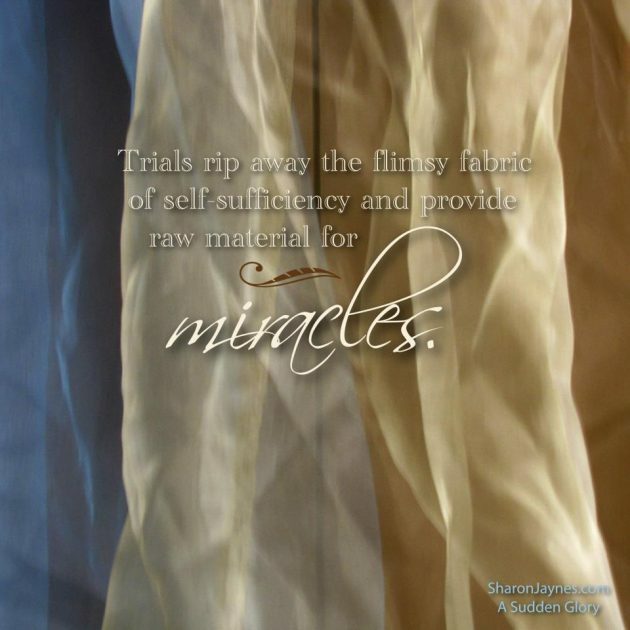 Trials rip away the flimsy fabric of self-sufficiency and provide raw material for miracles Click & Tweet! . Several years after the loss of our second child, I stood in the doorframe of my son’s bedroom watching him sleep. This sixteen-year-old man-child was six feet long and a tangle of sheets and limbs. One hairy leg hung off the bed, his thick shock of hair was sticking out in every direction, and his face needed a shave. I was struck once again with just how much I loved this boy…my only son. Then John 3:16 washed over me like rain. For God So loved the world, that He gave His one and only Son, that whoever believes in Him shall not perish but have everlasting life. Again the words rained down. For God so loved the world, that He gave His one and only Son, that whosoever shall believe in Him shall not perish but have everlasting life. Tears filled my eyes as I understood God’s great sacrifice as never before. Why had I missed it these sixteen years? I have a one and only son. There are many people I love in this world, but there is no one, absolutely no one, that I love enough to give my only son. And yet, God loved me enough to give His Son for me. Not only that, He has given me a living, walking, talking example of that great love every time I see my son’s face. If that is the only reason for the years of infertility and loss, then it is enough. A sudden glory! God’s great love took my breath away once again. I want to encourage you to look through the rent places of your soul today. God, what do You want me to see. Share one way you saw God presence in a difficult situation. 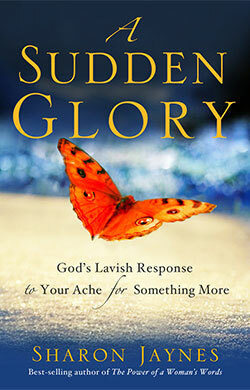 I’m going to randomly pick one comment and send a free copy of my book, A Sudden Glory. The good news is that “something” more does not mean “doing more.” God’s not waiting for you to get your spiritual life “right.” He’s pursuing you smack dab in the middle of your busy, messy day. He desires to commune with you right where you are. So take a deep breath, grab God’s hand, and discover the secret to experiencing God’s presence in a deeper and more intimate way than ever before. A Sudden Glory: God’s Lavish Response to Your Ache for Something More, includes a Bible study and free on-line Bible study video. As tragic as time could have been and the struggle of coming to grips with the most painful time in my life…..God reassured me that nothing happens in life without His permission and purpose. I struggle with this at the death of our 11 year old son. His conception and his delivery was totally different and so was his life. We experienced so much in those 11 years, traveling, baseball games, fun times galore not knowing that we would never see this young man grow up to adulthood. How painful life can be….how devastating the pain of losing a child can be…..GOD taught me that HE IS ALWAYS IN CONTROL and His LOVE IS SUFFICIENT! During Christmas and New Year I was in a lot of pain.The results from the hospital still not given to me.Feeling sleepy I felt a hand in mine,then I slept.Both my husband and son have big hand’s and this hand was not.I know it was JESUS. This was me for 4 years!! But God has been there with me even though I was angry with Him. So angry I pushed him out of my life. I didn’t understand ….and in all honesty I still don’t. But the story of Job came to me one day, did it make me feel better, no. But I knew God had a plan. He was patient with me and now I’m developing again my relationship with Him. I’m truly blessed that He doesn’t give up on us. I am trying to find the nugget of why I am going through cancer for a second time. I know God has a plan. When my friend was invited overseas to attend a discipleship training, expense free…..I felt pangs of jealousy. I realized God has chosen her to spread His kingdom in a way different than me. In her efforts and mine, we both are triumphant in His glory and grace. I can share her enthusiasm for the glory of God. Yes, God does use the painful moments in our lives to draw us closer to Him. Who would thank God for heart bypass surgery? That’s the operation my mother had to have as a result of type 2 diabetes. When she left the hospital, she stayed at my house for weeks as she recuperated from her surgery. Finally, she was able to return to her own home as she desired. Then, only three weeks later, she had a massive stroke and died. I commented later as I spike at her memorial service, “Who would thank God for heart surgery?” I did. Though not something any of us would look forward to, heart surgery is what gave me those special weeks to be with my mom after her surgery. I was with her everyday-preparing meals, helping her bathe, just spending time with her. That time was a special gift from God. He knew she would be leaving her earthly home soon. That time was a special farwell gift that I could thank Him for after she was gone. Thank you, God, for the unexpected, painful moments. I’m 52, Christian , wife, mother of adult children and owner of a very large hair salon . Betrayal of friendship , people’s lack of integrity seem to pierce my soul . The sting is real. Thank you for your blog because it helps me see through the heartache and find possible the purpose of the pain . Hi Sharon. As a follow up to my previous comment: I think the “sudden glory” moment was after my mother died when I remembered that God had given me that special extended time to be with her after her surgery. Losing my mom was one of the very painful losses in my life because we were close. But remembering the extended time God gave me with her reminded me that He loved me and that He was with me and caring for me during that difficult time. reading our bible and keep the fellowship of the church (Heb.10:25). I see God’s presence every day. I too have only one child my beautiful daughter who has suffered from a sudden onset of seizures at age 14. Cause unknown, prognosis unknown, future unknown. You have the blessing of a healthy son. Yet there are many moms like me who face the full Sovereignity of our God in the mess of what illness such as this can cause. The repercussions are many; she suffers a lot of losses but through it all she has been strengthened in her desire to follow Jesus. We have nothing as a family but His hope. This is raw and fresh and in every moment of every day. In Gods strength alone we keep going. But He lives through it all. Praise our Lord Jesus! The way I saw God through the trials was when infertility took over my life. I prayed for many years for a child. When we were running into more than we could afford, my husband and I prayed and at that point we told Jesus have our lives and our hearts do as you will we are living for you God. From that day forward we started to plan fun activities that glorified God and forgot all about fertility and hurting. I kid you not only one month later I was asked if I wanted to adopt a child who was recently conceived. I didn’t know the miraculous plan God had. 5 months later I became a mom of a beautiful little girl. God knew she needed me as much as I needed her. 9 months after her birth I was diagnosed with multiple sclerosis. If I had got pregnant I would have damaged my body and progressed my illness and possibly passed it to my child. God knows all and I could keep going with the miracles he’s blessed me with, but I’d take all year!! God is good and I’m fortunate to be gracefully blessed by an awesome father who protects my decisions daily ?????? Years ago when our son was struggling through a difficult marriage, my husband and I prayed for eyes to be opened. God kept saying “Be still and know that I am God” over and over. Our son grew and matured in Christ in ways we may never fully understand. God is faithful. My eyes were open ed too. Thank you, Jesus for your constant love. I believe I have seen God through many difficult situations. But there’s one that comes to my mind right now. My family of 4 moved in with my in-laws and it was hard for me to accept that this was a step I had to take to someday have my own home. My mother-in-law has a serious heart condition and cannot work and my husband is an only child so we have to help with everything (dr. appointments, etc). She helps a lot with the children and loves having my daughters at home. While we lived there, my mother-in-law’s mother was in a nursing home and she visited her (feeding her, bathing her, staying with her all day) 5 days out of the week. She cared for her until she died. It was a difficult time for my husband and his family, losing his grandmother. The only one left. But I realized it was better for everyone, for my mother-in-law especially that we lived there with her. To keep her going. To give her something to do — be with my girls, take care of them. If we weren’t there, she would have been alone all day long. It would have been so much harder. So I believe we were meant to go live in that house, to be there to help my mother in law see God for herself as well. To still love life through my daughters. There are often times when I get upset with God and asked why my husband Steven and I we’re not blessed with children. Yet, his nieces bith have made bad decisions in their lives are either involved with drugs or hang with people who are on drugs and they have been blessed with children. As a nicu nurse, I see so many women who have children who are not ready for the commitment of motherhood. I realized that God has called me to serve in other ways and to share my love in other forms. We are now being blessed tonight with our second four-legged child who lost her home but we are praying it will be happy to have us as her forever home. I also have a one and only son who will be leaving for college shortly. The biggest cry of my heart has been to have more children. But even so I am so grateful to have had at least one child to love. It has opened a whole new door in my heart that couldn’t have been there before. Even with the mistakes that he is making now I am so glad to have and love him. As I read your question I wondered if I am mad at God. My 54 year old husband of 16 years is terminally ill. I wake every morning with this knowledge. My heart is broken. I try to remember who God is everyday. He is good, He is grace, He is mercy, He is healer. As I go through our painful journey I also see God as the God who gives and takes away. Job 1:21 says “The LORD gave and the LORD has taken away; may the name of the LORD be praised.” My prayer is that we both can praise His name as we walk through this trial giving Him all the glory and praise because He is God and deserves all our praise. I love, love this book. The Lord has shown me so many of his sudden glory, whenever I get so wrapped up in my day, I will stop and ask God to show me a sudden glory and he is so great that he does, and it reminds me how much he loves me. God has shown up again and again, especially when I’m walking away from Him, sometimes even running, because I blame Him for this humanity. I recently found that the more I stand in the storm, and I wait… And wait some more… He does the seemingly impossible. I needed a place for my son and I to stay for 6 months, as we were looking for a home. I had sold my condo in one day (praise God, but really?). I was chatting about this predicament with my bank teller at Kroger, cart loaded with melting groceries, and she told me she and her husband had just moved from a condo to a new house. She suggested I call her landlord. I immediatel did just that, and to my amazement, he was a member of our church and gave us a 6 month lease that was very affordable. He said he had prayed about it, and felt it was the “right” thing to do, even though he never does short leases. Having faith, doing the mundane things like getting groceries, and waiting for God’s blessings, are so against my Type A, controlling, must have a plan, inpatient self. I am a slow learner, but the Great Teacher allowed me to see how He knows… he always knows, how I learn best. My learning curve is getting steeper, and my faith is stronger, as I trust that He always has the right answers to the exams of my life! My grades are rising, not because I’m getting smarter, but because I trust God’s learning process. All praise to Him! The night of Wednesday May 9th, 2012, our Bible study group was studying about Job. Our pastor used Isaiah 45:7 as a supporting scripture. I didn’t understand the significance of that scripture that night. The next day around 2:30pm, I received a phone call at my office that my 33 year old brother-in-law had suddenly passed away in a car accident. He left behind my sister and 3 young children. Shawn had been her junior high school sweetheart…they had been together since she was 13 and he’d been my brother since I was 9. It ripped a hole in our hearts. My husband picked me up from work and held my hand as we drove to my sister’s. And in the quiet sobs, God reminded me of that scripture. “I form the light, and create darkness: I make peace, and create evil: I the Lord do all these things.” In my sudden glory moment, I realized that nothing happens in our lives that doesn’t pass through His hands first. He knows what He is doing and this didn’t surprise Him. It was a part of His grander plan. And I was immediately flooded with peace. Sure I was sad, but God provided peace before I ever reached my sister’s house. God’s sudden glory moments are unexpected and overwhelmingly soul satisfying! Only becuz of the lesson it taught me! It’s still there, but my focus changed. Praise God He changed my eyesight! What an awesome story!!!! I hope everyone who visits the comments will read this one. Yes, I get it too. Thtee beautiful daughters who are awesome and wonderful in their own way. Yet not one of them made good choices in life, one pregnant at 17, one pregnant at 25, still not married and another on living a lifestyle that is wrong. Yet God’s grace has blessed me far and beyond what I deserve and that grace I give to my girls. His love has no bounds for me and has no limit to them. One day things will change and they too, will walk wholeheartedly wi th the Lord. But until then, He comforts me and gives me the hope and joy of having them alive and well and the gift of grandparenting. We are a family who loves and freely gives love to one another and to others. A lesson I have had to learn is disappointmen’s are just a blurb in life and He will use them for His glory. His word has always been a light onto my feet and i learned to put ALL my hope in God. His presence comes and floods me when i think of the what ifs…I thank Him for it all. Thank you for your ministry, it blesses me. I see God’s presence today, as I have seen him so many times this past year. I live in Hidden Valley Lake, CA. Just a few miles away, our small county is suffering another horrendous wildfire. Last year, our home was spared as wildfire surround our community, not once, but three times! If you looked at a map and saw our home, we were in the center of all the wildfires. God spared us from The Rocky Fire, The Jerusalem Fire and finally The Valley Fire, which was the 3rd most destructive fire in California’s history. Some people lost their lives, many lost their homes and our community church burned to the ground, as the wildfire raged through our small town. Today, while I watch the destructive images on the news of the homes and lives destroyed by The Clayton Fire in Lower Lake, California, I am crying. My husband is a LCSO deputy, and has spent these past few days doing what he states as God’s calling in evacuating and saving lives. I reluctantly started packing a few mementos and clothing in case the fire headed this way and prayed that this fire would be put out soon. Through all the crazy need to get ready, I broke down from the emotional exhaustion. I prayed for the strength that I did not have, to continue on and stay focused. This is when I feel God’s presence the most, always when going through a trial. And God answered me in his calming and reassuring way, once again reminding me what HE has brought us through. Not only did we not perish or lose our home last year, but even if we had, I know HE would carry us through it. I am crying not just for the sadness I feel for others who are experiencing so much devastation right now, but for the joy I feel knowing that our God is always present. When we hurt, HE is with us and helping us to see through the pain. Thank you for your devotional today, because I believe God meant for me to see it. When God reminds me through John 3:16 of HIS sacrifice, I know that God is showing me how much he understands our pain. God will never forsake us! “Be strong and courageous. Do not fear or be in dread of them, for it is the Lord your God who goes with you. He will not leave you or forsake you” (English Standard Version, Deut. 31.6). On May 16, 2016, I received a text from a friend asking if I had heard what had happened to another friend of ours. That other friend happened to be the guy I had previously been dating and cared very deeply for. Unfortunately he had a lot of demons that he was not able to cope with and resorted to alcohol to heal him. I knew I could not live that way with my son and chose to break it off with him a year before. We kept in minimal contact however. I was told by our mutual friend that he had passed away in a car accident that afternoon. I was crushed. The next morning I phoned up at his parents to talk to his mom to find out the details. His father answered the phone and that is when I found out that both my friend and his mom had been killed in the single car accident. I was dumbfounded, numb, heartbroken, angry, sadness beyond belief….the list goes on. For that next week, while living in a cloud, Heavenly Father showed up every morning telling me He was there for me. Sleep was difficult for me and I would hit snooze multiple times in the morning before finally getting myself out of bed. It was random times each morning when I would decide the next time the snooze would go off would be the time I finally got up. Every time that next snooze would go for the entire 7 days, “Tell Your Heart to Beat Again” by Danny Gokey would play. I know it was Heavenly Father telling me everything was going to be okay and that it was time to let my heart beat again. I have had numerous witnesses of Heavenly Father’s presence during difficult situations but this is the one that is forefront on my heart at the moment. God is always with me because God has me in the palm of His hands! No matter what I go through even when I had cancer, emotional problem, and terrible pain! God care so much and I love Him! My Sudden Glory moment is when I realized God was pulling me near after a divorce and attempted overdose. I didn’t get married until I was 33…didn’t think I would find someone to love me…but I thought I finally did. I was a single mom…another story I could use….and he a single dad. Combining a family of 3 children total an interfering and dysfunctional x wife. It was rocky from the start. He had affair with my best friend at the time after 9 years of marriage. Our families did things together all the time…it broke apart 2 families. I fell into deep depression and overdosed. But then God took hold of me and said…your life and experience will be of good use to help others get through this. Your strength and reliance on me has grown and I am pleased that you will walk with me and use your hurt to get others through similar times…and he has many times over! I found God in my life even more…began seeking wisdom….discernment….how I can truly be God’s child! My life has grown abundantly since that day I finally gave control to Him and understood why the trials in life are for good when you look through the hurt and find God! Thank you Sharon…I love your blogs and books. GIG has been a big part of my growth as I walk with Our Lord! I had a similar experience as yours where God gave and then took away. My husband of 23 years was having an affair, I prayed and felt God told me he would return. After his 9 month affair, he did return but then left 4 months later back to the other woman. I felt lost and betrayed, but realized that I am nothing without God. Where and who would I turn to if not the great I AM. It has been over 2 years since that happened and I have learned and grown so much. My ex husband is no longer with that other woman and recently was in a motorcycle accident where he sustained Traumatic Brain Injury. I am not sure what God has planned, but my prayer is that this may bring reconciliation between him and our kids. Thank you for your words Sharon. I was really mad at God when my son was diagnosed with Autism. I asked myself why God why? I thought He was punishing me. I ran away hard the opposite way of His will. But He never stopped loving me and saved me from myself. I thank God everyday for my fearfully and wonderfully made child. Who is completely unique is his own way. I am so blessed to be his mama. God bless you Sharon and your ministry. For 10 years I have been in a tumultuous relationship & marriage with the man I know God told me to stay with because he had been so neglected as a child he had never known real love. I believe The Lord wants me here even in the midst of his mental illness to show my husband what true unconditional love looks like. Some days I hide, some days I cry, some days I’m totally thrilled and happy with my life, my husband, and his loving care… but not many….. Recently the The Lord began to show me that I have made an idol of my husband and look to him for my deepest needs to be met….. and he just isn’t the one that was made to meet them. I’ll tell you I haven’t been thrilled with this revelation and I am struggling every day to become more healthy and to put God in first place, not Dan. It’s not fun to live day after day in these circumstances but it is amazing to live day after day knowing I have a Father in heaven who is with me, who loves me, and who will do what it takes to draw me to Him. I can relat to not being able to have another baby the same happened to me. I had two but wanted another went through lots of tests and found out my husband was the problem. Tried adoption but each time they kept the baby. Finally a girl I was helping with her baby wanted to give me hers but s.s. Took her away then she died. I couldn’t understand what God was doing but soon learned at the funeral that she had to died for the salvation of her father it was hard but that made things seem better.sometimes we just need to trust God knows what is busy for us.never got another but became a young grandmother and lots of other children along the way. When my one and only son Johnny went home to Heaven in 2006 I was crushed. But in 2007 God gave me a Grandson who resembles my Johnny. I feel very Blessed to have been given Johnny for 19 years and a Grandson too. Such special gifts from God. When my husband was diagnosed with cancer, I prayed & believed with everything in me that he would be cured. I even told the oncologist that even though he couldn’t do anything more for my husband, God could & would. When my husband passed away just months later, I was devastated, hurt, and angry. When I was as low as I could go, the only way to reach was up, & He was there to take my hand & pull me up. It certainly wasn’t right away, but over the course of months my heart started to heal as I let Jesus hold me & give me His strength. Our sons & I still miss him every day, but we are comforted by the love of our heavenly Father & knowing we will see him again. Hi Linda. You are the winner of a copy of A Sudden Glory. Please email your address to sharon@sharonjaynes.com. Congratulations! I read these encouraging posts at a time when I’ve been feeling low and am so blessed. I was diagnosed with lymphedema 22 years ago and God has been faithful all the time. I at times suffer low self esteem but every time I remember that God is Jehovah Rapha, it becomes a glory moment and I receive the strength to move on. I have seen many divine interventions in my life and my faith has really grown. So no matter what you have experienced; just know that God was there and He knows why and He has a good plan for you no matter what.